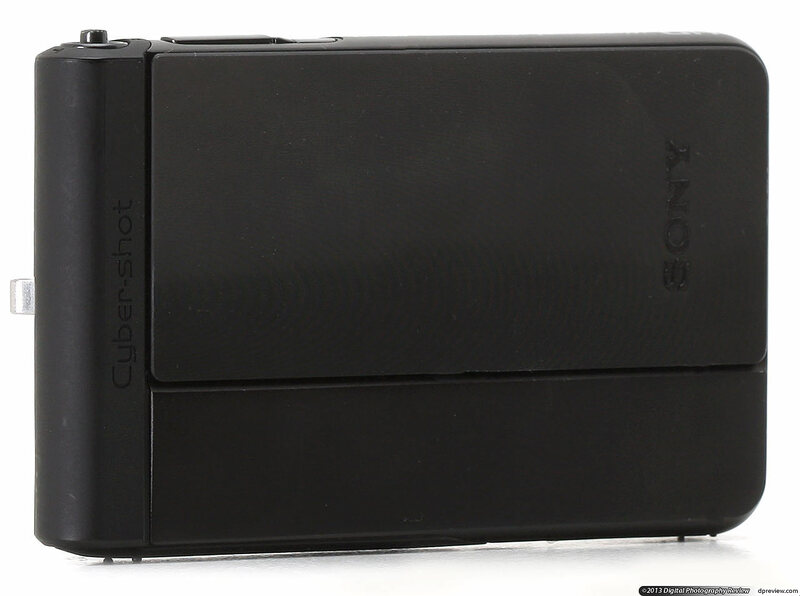 The Cyber-shot DSC-TX30 has a design that's very similar to its T-series predecessors. That means that the body is extraordinarily thin (just 15.4mm / 0.6 in) and made entirely of metal. There are four colors to choose from: black, blue, pink, and orange. Because of its size and relatively light weight, the TX30 doesn't feel quite as rugged as its competitors, but we aren't about to drop it on the floor to find out how it will hold up. 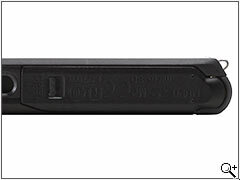 The TX30 has the same sliding lens cover design from earlier T-series models that some people love, and others can't stand. The door doubles as a power switch, in addition to protecting the lens. One big frustration we had in the real world with that sliding door is that water and sand tend to get caught under it. Since there's no way to actually get under that door, you cannot clean it. If you close the door, which you'll want to do eventually, the water and the sand gets transferred to the top part of the camera, around the lens and flash. The TX30 is indeed very slim, but we didn't like how all the buttons felt the same. in addition, the zoom controller is small and awkward. One big problem with the TX30's huge touchscreen is that there's nowhere to put your thumb. That makes it very easy to accidentally press something on it. The location of your thumb isn't the only thing to watch out for. The fingers on your left hand can easily end up in the photo if you try to support the camera, since the lens is placed on the edge of the camera body. Just because a camera looks delicate, it doesn't mean that it can't take a beating. 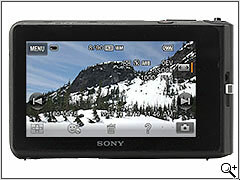 Sony says that the TX30 can spend up to an hour underwater at depths of up to 10 meters (33 feet). It can be dropped from 1.5 meters (about 5 feet) if a bout of clumsiness strikes. As you might expect, the TX30 is also dustproof. Nobody wants drops of water on their lens and the TX30 sheds them quickly, both in our 'dunk test' and in the real world. 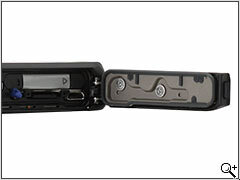 The TX30 has a single door, which contains its combination microSDHC/Memory Stick Pro Duo slot and battery, along with its micro-HDMI and USB ports. There's only one lock, though it's nearly impossible to open accidentally. As with all weatherproof cameras, there's a rubber gasket that keeps water and dust from getting inside the camera. While the camera generally doesn't remind you to check the seals, it will flash a warning when you select the waterproof scene mode. 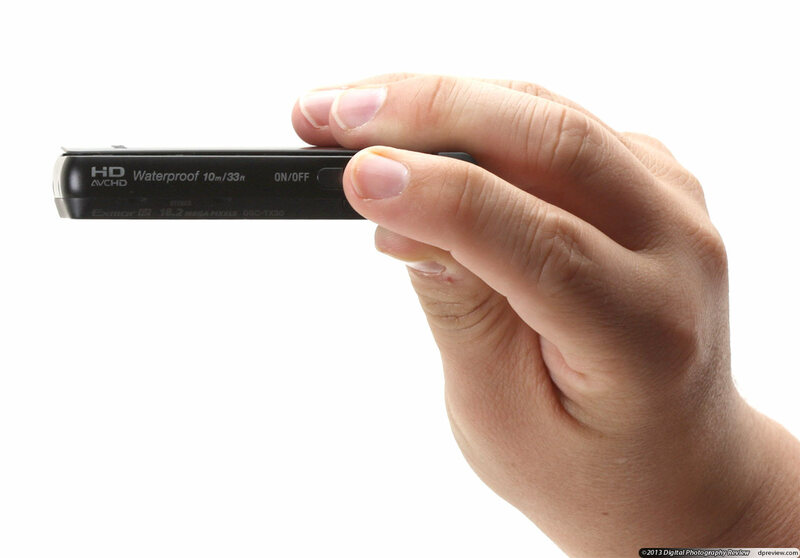 The TX30 has a large 3.3-inch OLED display on its backside, and absolutely zero buttons. The screen is gorgeous when indoors - with vivid color, a wide viewing angle, and 1.23 million dots. This display is far from perfect though, as you'll find out below. One thing that nobody will argue with is how sharp photos are on the TX30's widescreen OLED display. This screen has over 1.23 million dots, though you'll only get to take advantage of all that resolution when shooting or viewing photos at 16:9. Unfortunately, this OLED display - which is so appealing indoors - falls short when you head outdoors. In bright sunlight, visibility is very poor, and you'll need to max out the brightness in order to see anything. Results are similar underwater. An issue	with having a widescreen display on a camera that shoots stills at 4:3 is that you'll get borders on the sides of the frame. Sony does put them to good use though, with touch controls on both sides. 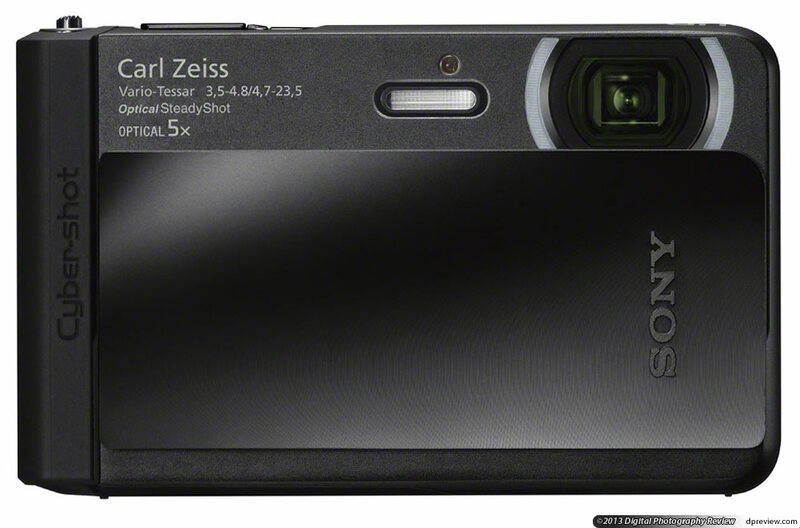 Sony's biggest mistake on the TX30 - as well as its predecessor - is making a 'tough' camera with a capacitive touchscreen display. While it works just fine above water, offering touch focus, menus, and the ability to 'swipe' through photos in playback mode. The problem is that becomes completely useless once you get it wet. Want to change a setting, such as the flash or white balance, while snorkeling? Sorry, you're out of luck. Even if the camera has a few drops of water on the display, it will be unresponsive or not act is intended. In other words, this camera is not for serious underwater use. 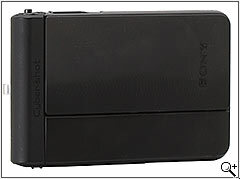 If Sony put	some physical buttons on the camera - or used a pressure-sensitive touchscreen, the story would be very different. One final thing to mention about the OLED display on the TX30 is that it's a magnet for scratches. We were pretty gentle on our TX30 sample, and it had numerous scratches on the display - and we're not the only one to have this issue. Some of the lettering on the front of the camera also started to rub off after a few weeks of usage. The TX30 has a very small flash, which has a range of 0.1 - 3.3 m at wide-angle and 0.6 - 2.4 m at telephoto. That's at Auto ISO, which you may not want to use in low light. Above the flash is the AF-assist lamp which, as its name implies, helps the camera focus in low light. The DSC-TX30 has an extraordinarily weak flash. The maximum range listed above is at Auto ISO, which tops out at ISO 1600 - a sensitivity you probably want to avoid. If you drop the ISO down to a more reasonable 400, the flash range is just 0.8 m at wide-angle and 0.6 m at telephoto - not good at all. The four menu items (pictured earlier) shown on the left margin when shooting photos can be customized, as the video above illustrates. The main menu has large 'buttons' that cover the most important shooting items. There's a more conventional setup menu available by pressing the 'suitcase' icon at top-left. One nice thing about the DSC-TX30 is that Sony has built-in a pretty elaborate help system. From the main menu you can press the question mark icon and then press the item you want more information about. A sample of the 'contextual' help available for menu items. The main In-Camera Guide section offers in-depth help that goes beyond the basics. The In-Camera Guide is a nice addition to the TX30, and covers things like tracking focus, metering, white balance, and much more. 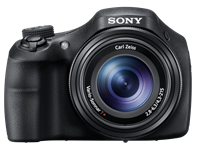 The Cyber-shot TX30 is very much a point-and-shoot camera, with very little manual control. It has a pair of Auto modes, plenty of scene modes, and the requisite collection of 'Picture Effects'. 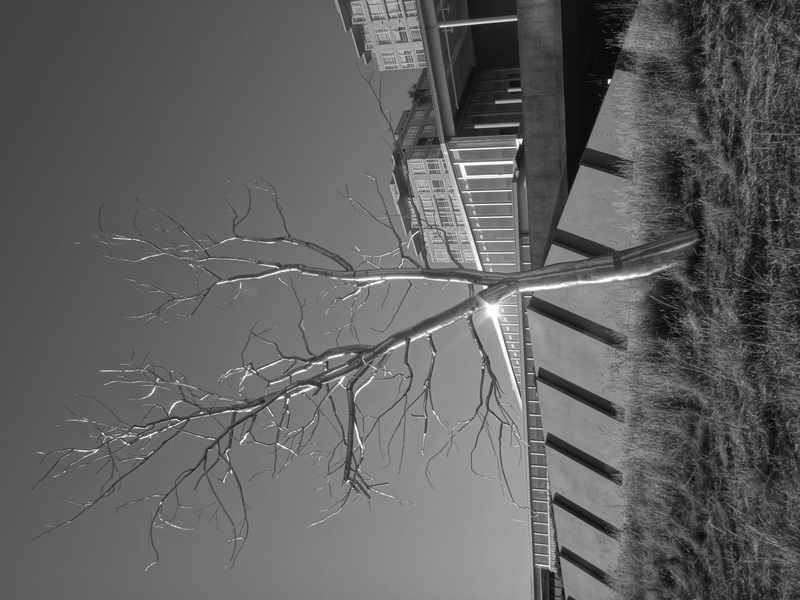 The only manual controls are for exposure compensation and white balance. 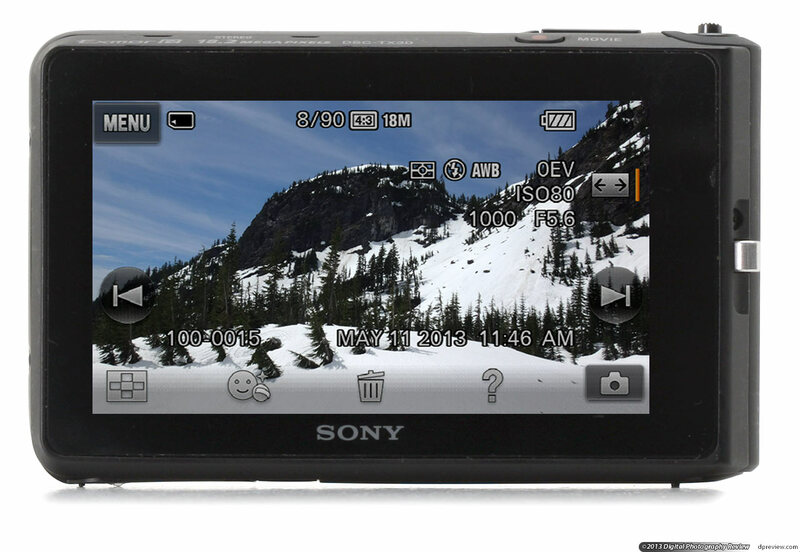 Unlike many of its competitors, there's no underwater white balance mode on the TX30. 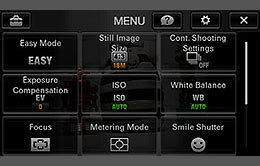 The REC mode menu, accessed by pressing 'Mode' on the shooting screen, has a nice set of options, including 'Picture Effects' and scene modes. The Intelligent Auto mode is nice, with automatic scene selection, but the Superior Auto mode goes a step further. It'll still pick a scene mode for you, but widens the selection to include three 'layered' modes: Hand-held Twilight, Anti Motion Blur, and Backlight Correction HDR. 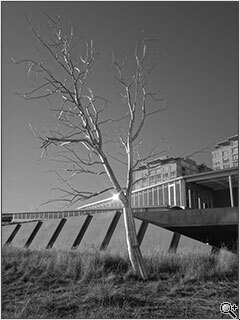 Each of these modes take several exposures in a row and then combines them into a single image, with the aim of improving contrast or reducing blur. You don't need to be a camera reviewer to see the difference between those two shots. There's a lot less highlight clipping, shadows are brighter, and the overall contrast has a much better balance. One nice thing about the HDR feature on the TX30 is that it shoots so quickly that no tripod is needed. An added bonus is that you won't have 'duplicate' versions of moving subjects in your HDR photos, since the camera removes them automatically. You can select the three multi-shot features manually via the scene menu. You'll find numerous other scene modes there as well, including an underwater option. 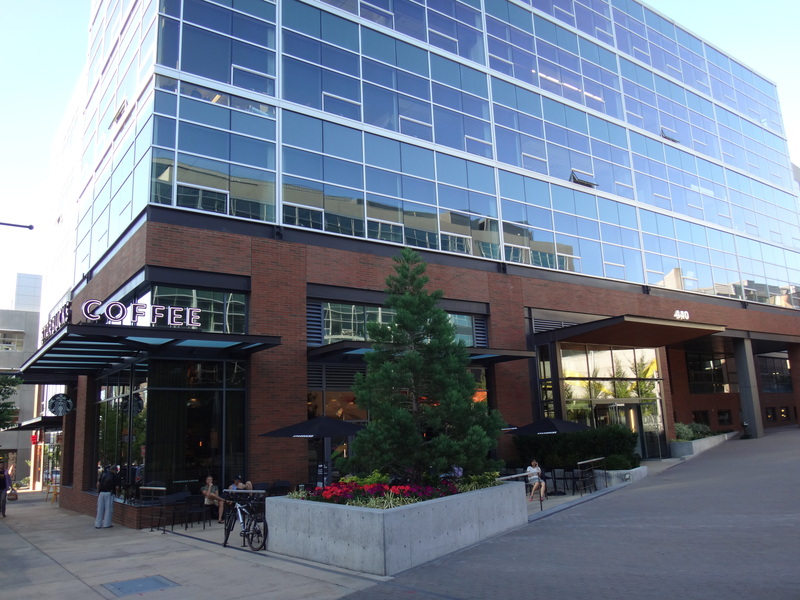 The rich-tone monotone gives the metal tree at left a more bold appearance. 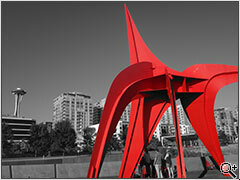 The partial color photo above is a favorite of many, and really makes this Calder sculpture stand out. The	TX30's Picture Effects are fairly standard by compact camera standards, and include illustration, partial color, miniature effect, and HDR painting (which creates an very exaggerated HDR effect). 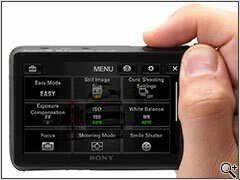 Sony was the first to include a 'Sweep Panorama' feature on its cameras, and its latest models feature 'iSweep Panorama". 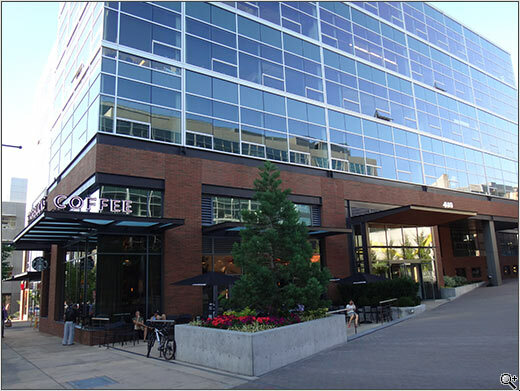 The cool part about iSweep Panorama is that the camera prevents people and other moving subjects from appearing in multiple places in the panorama. 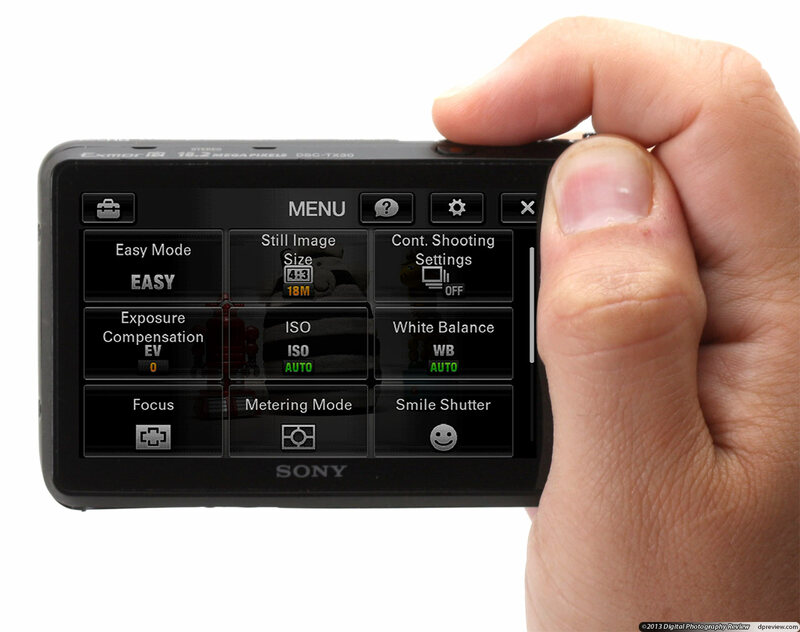 There are two top-level iSweep Panorama modes to choose from: regular and underwater. 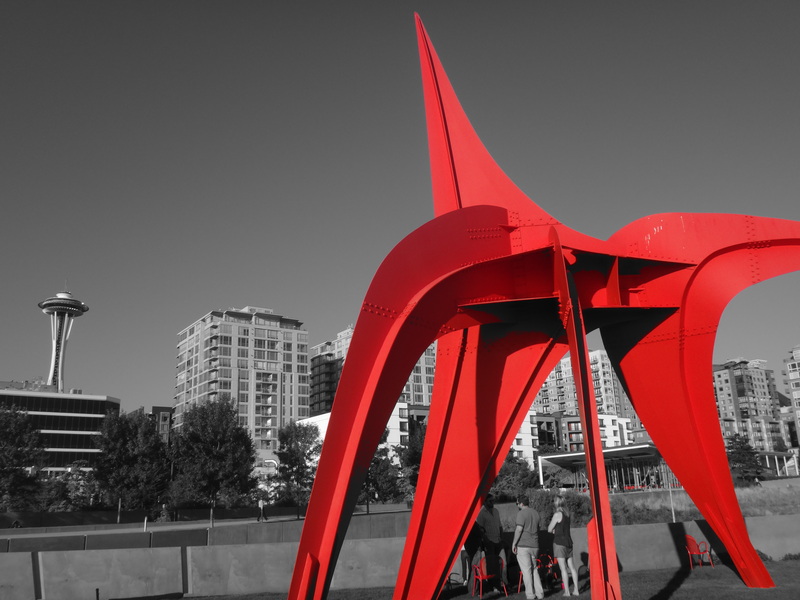 You can also apply three Picture Effects (pop color, partial color, and soft high-key) to an image. Once that's done you just 'sweep' the camera from one side to the other (you can go up or down as well). The results are stitched instantly. There are four sizes to choose from: standard (4912 x 1080 vertically), wide (7152 x 1080), 360 degree (11520 x 1080), and high resolution (10480 x 4096). For those unfamiliar with the sweep panorama feature, these images are much higher resolution than normal. Speaking of high resolution, you'll take photos for that mode holding the camera vertically. Although the final result is rather soft, the TX30 did a perfect job of stitching this image together. This high resolution panorama, on the other hand, has obvious vertical banding in the image. We were able to replicate this repeatedly. If you're sticking to the 'standard' sweep panorama - which uses the camera's movie mode to create images - you'll get good results. 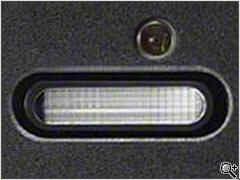 Based on what we've seen, the high resolution mode - which uses the electronic shutter - is best avoided. 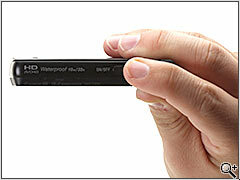 The DSC-TX30 is able to record video at 1080/60i with stereo sound, for up to 29 minutes using the AVCHD codec. While the video is very smooth, you'll notice the problem with interlaced videos: rows of horizontal lines, especially on moving subjects. The good news is that you can "deinterlace" videos using software on your Mac or PC (we used Handbrake with pleasing results). If you want to save some space on your memory card, you can opt for a lower bit rate (17Mbps vs 24Mbps), or a smaller resolution (1440 x 1080). If you'd rather using something other than AVCHD - which can be difficult to share without editing it first - the TX30 also offers the MPEG-4 codec. You won't be able to record Full HD video, with the highest resolution being 1440 x 1080 (at 30 fps). The optical zoom can be used while you're recording, and the camera will keep things in focus as your subject moves around. The image stabilizer is also available, with a special 'Active' mode to reduce severe shake. A wind cut filter is available for shooting outdoors, though it wasn't a huge help, as you'll see in the sample on the next page. Another neat trick the camera can perform is to take up to ten 13 megapixel stills while simultaneously recording video - even at the highest resolution. The TX30 doesn't offer the ability to trim or split movies, which is a shame because that's always handy. One nice thing you can do in playback mode is enlarge photos to fill that giant 3.3" OLED display. There are a number of features in playback mode worth mentioning. You can sort through photos by date, using either 'cover flow' or calendar interfaces. You can apply picture effects, sharpen, and even 'paint' on your photos. If the camera detects a face in the scene, it will give you several retouching options, including skin toning, skin smoothing, shine removal, eye widening, and yes, even teeth whitening. Another somewhat-gimmicky feature lets you navigate through photos by tilting the camera side-to-side. We found it to be more trouble than it's worth. Something that we noticed is that the TX30 is fairly sluggish when you're in playback mode, especially when viewing thumbnails, or zooming in on a photo.